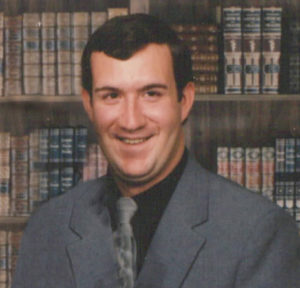 Richard James O’Loughlin, age 54, of Oak Creek, Wisconsin, passed away unexpectedly on January 17, 2019. Rich was born July 12, 1964, in Fond du Lac, Wisconsin to Jim and Joan (Sage) O’Loughlin. After graduating from Adams-Friendship High School, he enlisted in the United States Navy. He married Bernie Rock and had one son, Brian. Rich spent a lot of his career working for a Lumber Company as the yard manager. In his free time, Rich enjoyed researching genealogy and history to share with family, playing bass guitar, and visiting museums. Rich was preceded in death by his parents, Jim and Joan (Sage) O’Loughlin, his grandparents, and other extended family members. He is survived by his sister Molly (Doug) Wiese, son Brian O’Loughlin, friend, Diane Berndt, niece Brenna Bays, nephew Collin Bays, and many other extended family members. He was a great guy – many fond high school memories. So sorry for your loss. We were so sad to hear of the death of Richard know that we have him and you all in our Thoughts and Prayers. He is at Peace with our Savior and all his Heavenly Family. R.I.P. Godson. Brennan, Colin and Molly: sorry for your loss. Prayers and hugs. My deepest condolences to Brian,Molly and Doug, Brenna and Collin. I hope Richard is finally at peace and he is with Joan and Jim now. Molly I pray you are at peace also. My deepest condolences Molly, Diane and the rest of the family! You all continue to be in my thoughts and prayers. Really devastated to hear this. Richard, Molly, Jim and Joan were a viable part of our lives when we were younger and in high school. At the O’loughlin’s, we were always invited to a warm meal almost every night. Richard was one of those guys that one just gravitated to, and you never knew why. We’d often listen to Molly play the piano or Richard his guitar, only to be interrupted by the parrot. I can still hear Joan telling that parrot to shush and Richard oblivious to it all. Great times. Going to miss Richard, as he was quite the character. We loved that whole family. Molly, our prayers are with you. May God hold you in His palms. Hoping he is finally at peace. Molly you and your family are in our thoughts and prayers. Molly & family – so sorry to hear about your brother. Our deepest sympathies – hugs & prayers. Richard you will be missed! Will miss our talks about our Grandparents and our Irish heritage. I’m so glad we reconnected after many lost years. I hope you are at peace. Molly and family, many hugs and prayers. Love to you all. With our sympathy to Molly & family; sorry for your loss. Love and Prayers to all of you! Thinking of you during this difficult time. Molly, I’m so sorry for your loss. You are in my thoughts and prayers. So sorry for your loss. May God comfort you and your family during this time. Our family will keep you and yours in our prayers. Molly and family please know you are in my prayers. So sorry to hear of the loss of your brother Richard. Heart wrenching to see this..hugs & prayers to you Molly & family..
Molly our thoughts and prayers are with you. Molly, I’m so sorry for your loss.